Lancashire youngster Liam Livingstone marked his first-class debut with an unbeaten half century to build a useful 69-run lead over Nottinghamshire. 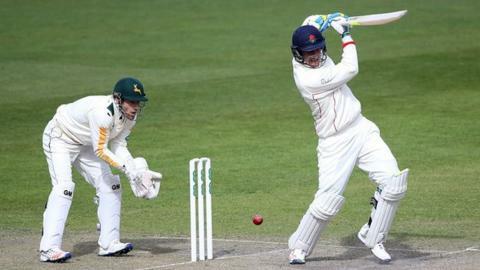 Resuming on 25-1 on day two, Lancashire batted throughout all three sessions to reach 311-8 at the close of play. England's Stuart Broad took 3-57, as did fellow paceman Jake Ball. But 55 from wicketkeeper Alex Davies, 48 from Alviro Petersen and then Livingstone's 63 not out helped the home side end the day on top. Coming in at number seven, at 156-5, with his side still 86 runs in arrears, Livingstone put on 72 for the sixth wicket with Davies. And the 22-year-old has so far put on a further 62 for the ninth wicket with Zimbabwean Kyle Jarvis, who ended the day also unbeaten on 36. Earlier, Warrington-born Steven Mullaney claimed the 50th first-class victim of his career on his old home ground when he had his former Red Rose team-mate, Lancashire captain Steven Croft, caught behind for 15. "I found out I was going to play on Friday afternoon. It's been a very good day for me but also for the team. We're in a strong position. "There's still two days left in the game so we're looking at building as big a lead as we can, so that we can set attacking fields in their second innings. "A lot's been said that we've got a young squad but that doesn't mean that we're not talented enough to fill the gap left by Ashwell Prince. We're all working hard to try and prove people wrong." "Obviously, it's a pretty flat wicket but we did well to contain them. After the new ball lost its shine it was tough work. "It was disappointing we couldn't break that partnership. Once it got soft there wasn't much bounce or movement at all. "They're only 69 ahead so hopefully we can get these last two wickets early. We can still get a positive result. Hopefully the wicket will start to go up and down and maybe reverse swing will come into it. If we can get a reasonable lead, you never know on day four."